In March, playing a preview build of Watch Dogs in Montreal, I found myself fixated on one word: Soda. In one of the random missions available to me, I spotted the word brandished on the front of a vending machine deep within a building that protagonist Aiden Pearce was assigned to invade. Something about it felt wrong. There are generally two recognized generic terms for carbonated beverages throughout North America: Soda and pop. (Texas calls everything Coke.) Based on a study by a German linguistics and philology major from the University of Wisconsin-Madison in 2008, Illinois is primarily "pop" territory. Though Ubisoft Montreal did not set out to create a carbon copy of Chicago for its Watch Dogs setting, the developer says it worked hard to ensure the experience was authentic to its real life setting. Regional language, Watch Dogs lead writer Kevin Shortt says, was something the developer knew it had to get right. Soda would become pop. Characters would no longer say "waterfront" as it was originally written, but rather use the local colloquialism "lakefront." While Ubisoft's version of Chicago isn't a reproduction of reality, the developer feels it has captured the essence of the city's strong cultural signature, despite being forced to bend a number elements to conform to its design and budget. There's more to building a recognizable city than just getting the skyline right, as it turns out. "Yes we worked hard to ensure the in-game language reflected Chicago. So we learned details like Chicago saying pop over soda," Watch Dogs lead writer Kevin Shortt says, admitting the team had to make alterations to regional language within the script to ensure it was authentic to the city. Changes came from both those internally as well as actors and consultants, he adds. "We did a lot of research on Chicago. We visited the city several times, met with people. We did interviews with members of the Chicago PD who gave us valuable insights. In terms of language, they highlighted that the CPD is the only police department in America that refers to their dispatch operator as 'squad', and they don't use 10 codes like 10-20. So we made sure to reflect this in the police dialogs." But not everyone agrees on a definitive vernacular. "We had written 'Chi-town' in a few lines and we had conflicting reactions. Some people said they would never, ever say Chi-town. Others insisted it's a term used as a half-joke while others said they use it often. We kept the term in but reduced the times you'll hear it. It was always important to us that we reflect Chicago as faithfully as we can and that extends to the language and the accents you'll hear in the game." Ubisoft could have avoided the potential for linguistic gaffes if it had simply created its own city from scratch, but as Dominic Guay explains, the studio felt that Chicago was too perfect a fit for Watch Dogs to turn up. From its under and upper city landscape design to the river that crosses the a city peppered with drawbridges, Chicago was a location that begged to be recreated for a video game. "Sometimes it almost looks like it's built by game designers," Watch Dogs producer Dominic Guay tells me. "It's beautiful architectural-wise, a lot of iconic elements." While creating a unique or even a Liberty City-style knock off location for their open world would have afforded Ubisoft Montreal the opportunity to craft the architecture to suit its gameplay, a fake city lacks a cultural imprint and worldwide identity. It lacks history – a commodity Chicago is rich in. 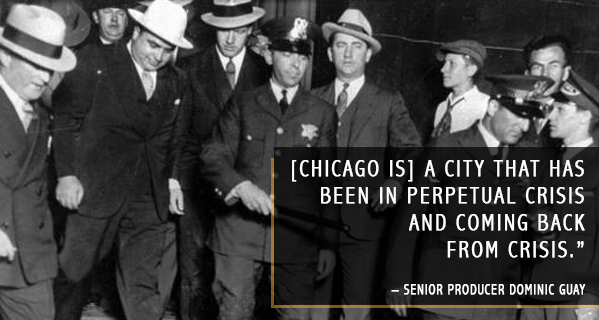 "If you look at the history, there's been crime and corruption for a long time in Chicago. All those deep layers, like with Capone and even before that. It's a city that has been in perpetual crisis and coming back from crisis. That was very interesting to me. But also it's a city that, our research showed, has become one of the most surveilled city in North America," Guay says. Chicago's use of surveillance equipment, which has grown steadily since the introduction of a Homeland Security Grid dubbed 'Operation Virtual Shield (OVS)' in 2005, fit in perfectly with the themes Ubisoft Montreal was attempting to tackle. The city's International Secure Communications Network (ISCN) maintains over 350 miles of fiber optic cable, alerting authorities via a vast camera network and sensors, which attempt to detect biological, chemical, and radiological threats. In 2012, the city surpassed New York's own network of surveillance, becoming critical in cases of potential violent crime. "I can't think of a better city [to set Watch Dogs]; for us it was such a great fit," lead game designer Danny Belanger adds, also citing the city's layout, history and current security situation. With Chicago set as the game's location, the developer began recreating the city. Which is where it ran into a little problem. Exploring the open-world of Watch Dogs, players will happen upon a dozen buildings that look familiar, but seem a little off. Landmarks, for the most part, are given a similar name and a slightly different look to their real-world counterpart, but aren't an exact reproduction. World famous Soldier Field, home of the NFL's Chicago Bears, was transformed into May Stadium. Chicago's gorgeous Jay Pritzker Pavilion was tweaked and now bares the name Bram Steffan Pavilion. The historic Chicago Theatre near The Loop has been transformed into the Ambrose Theatre. Some of Chicago's famous buildings, however, survived the digital recreation. The 108-story Willis Tower, previously known as (and still often referred to as) the Sears Tower, can be found within the game. 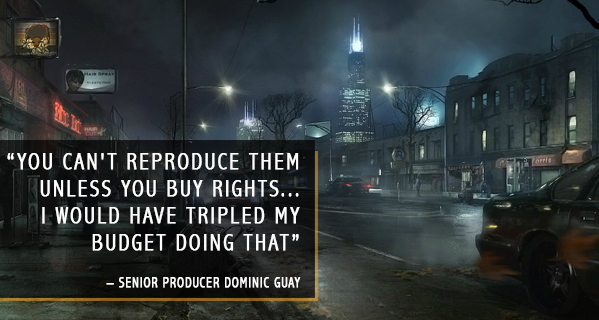 Watch Dogs producer Dominic Guay tells us that alterations made to landmarks in their version of Chicago isn't simply artistic license for the sake of making things different. Developers, he says, need to "be careful" when reproducing the real world. "I'm not an expert on it, but there's actually limits to how far you can go [in recreating landmarks], especially for more recent stuff because there might be, for example on a sculpture, artistic rights to it. The same for very recent architectures." While districts are represented in the game, including Chicago's famous Magnificent Mile, not all of the famous buildings peppering the city were available for free use. "You can't reproduce them unless you buy rights, now if you're making a movie you might have a few shots in those locations and that's totally fine. If you're making an entire city in a game, man I would have tripled my budget doing that. You do need to twist some things, especially in a city like Chicago that has very modern areas and very modern buildings. You need to be careful. There's a lot of historical areas that we could reproduce one-to-one, but also we did keep the same overall feel for every neighborhood or location." Shying away from that one-to-one replica also affords Ubisoft Montreal the ability to scatter a variety of district themes within its map. Business districts are merely a quick drive from sprawling residential areas, something not true to life. Chicago natives, for example, won't be able to find their house. "It would make a very boring world, to be honest," Guay laughs. "You'd be stuck in traffic for a half hour." 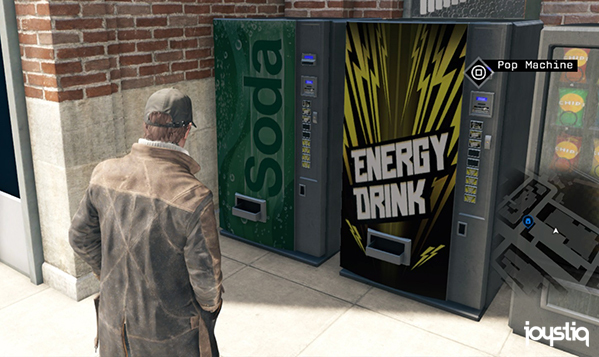 In the final version of Watch Dogs, machines still read "Soda," but in-game prompts offer a "pop." Close enough, we suppose. Despite having a city plan to reference, Ubisoft Montreal faced a series of obstacles bringing Chicago to life in Watch Dogs; obstacles video game players typically don't consider. From the licensing concerns of world famous landmarks to the natural language of a city, the game's developer attempted to mimic for authenticity, Watch Dogs' version of Chicago is rooted in the essence of the cultural metropolis.